This is a great pattern! The instructions were clear and thorough, and my finished bunny is adorable. The shaping is great and it has the sweetest expression. I'll definitely make more bunnies and also try more Planet June patterns (this was my first one). 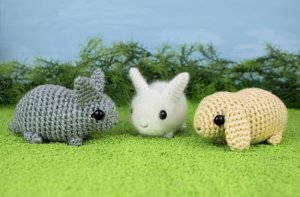 While I was making my bunny, I kept referring to June's crochet tutorials, and they guided me through everything I needed help with. I don't have a ton of crochet experience but this pattern presented no problems (well, except for me misreading a line and adding an extra round. But that was entirely my fault and the bunny looks great regardless.). Fellow rabbit lovers-this is the pattern for you!